As The Reels Turn 1 iSlot Guide & Review - Casino Answers! As the Reels Turn 1: With Fiends Like You is a 5-reel, 15-line iSlot-branded video slot from Rival, featuring four different scatter symbols, free spins and five bonus games. You can play the As the Reels Turn iSlot at Bovada.Play at this years #1 online casino for United States - Slots.LV. As the Reels Turn 1 is the first episode in a series of soap opera-themed iSlots. As with all iSlots, As the Reels Turn has a storyline, which begins as soon as you start the game up. In the opening scene, you are introduced to one of the main characters, Matt Gray, who scoffs at people who are trying to get something for nothing, along with his pet piranha Ivan. The cutscenes are fully animated with voiceover dialogue. Symbols on As the Reels Turn are: El Paradiso, Cashino Chips, The Don, Matt G., Chrissy, Tommy W. (scatter), Ivan (scatter), Bonus (scatter), Advance to Next Scene (scatter), Confidential Envelope, Lobster and Wine. The Advance to Next Scene symbol does not pay out. To start playing As the Reels Turn, set your coin value. Your options are $0.01, $0.05, $0.10, $0.25, $0.50 and $1. Next, choose between 1-5 coins to bet per line. You can modify the number of active paylines as well, but we advise that you stick with 15 as to not miss out on wins. Once you’re ready to play, use the “Bet Max” button to play 5 coins and all 15 paylines or hit “Spin” to play the game at the preset values. The top fixed jackpot on the As the Reels Turn video slot is 1000 coins. You can win the jackpot by getting 5 of either the El Paradiso or Cashino Chips symbols on an active payline. To advance to the next scene on the As the Reels Turn iSlot, you must have 3 or more Advance to Next Scene scatter symbols appear on a spin. After viewing the second cutscene, you will play a bonus game where you get to choose which of two cars is cooler. You will be win a prize based on the coolness factor. To view your progress on As the Reels Turn, check the Game Map in the top right corner of your screen. You will come across more bonus games as you continue playing the As the Reels Turn slot machine. Get 3 or more Ivan the Fish scatter symbols anywhere on the reels to trigger 10 free spins at a 3X multiplier. During the free spins feature, all of your wins will be tripled. A counter will be displayed in the top left corner that will show how much you have won from the free spins feature as well as how many spins you have remaining. 3 or more Bonus symbols will trigger As the Reels Turns’ bonus game. 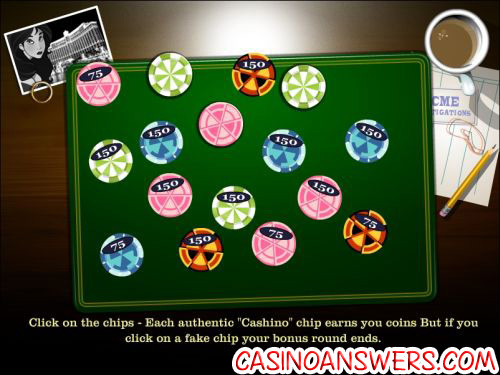 You must pick out which of the casino chips are authentic to win prizes and avoid the counterfeit chips that will end the bonus game. If you have 3 or more Tommy symbols appear anywhere on the reels on a spin, you will trigger the Tommy Wong Feature Act Bonus Round. In this bonus game, you must choose which one of four acts Tommy should perform today. You’ll win a prize based on the crowd response. All wins pay left to right only, except for scatters (which pay any). All wins are multiplied by the coins staked per line except scatters. Scatter wins are multiplied by the total bet staked. 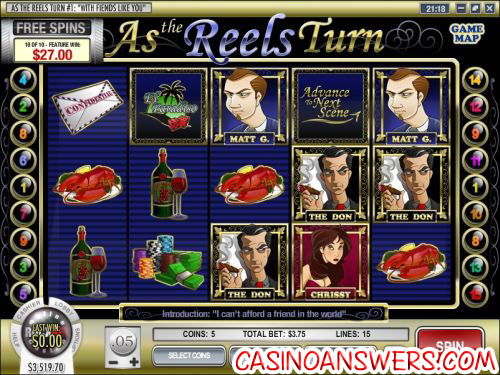 The As the Reels Turn iSlot is a very innovative video slot with interesting cutscenes and plenty of special features. If you’re looking to try this soap opera themed video slot, you can find it at Rival online casinos such as Bovada! Are USA players able to play As the Reels Turn for real money? Do I need to download any software to play As the Reels Turn? No, Rockbet Casino offers both casino download and no download instant play versions of As the Reels Turn. If you encounter any problems with the As the Reels Turn Flash game, make sure you have the latest version of Adobe Flash Player installed on your computer. An iSlot is a brand of interactive video slot developed by Rival that is available at online casinos such as including Rockbet Casino and DaVinci’s Gold Casino. For more on iSlots, please read our Heavyweight Gold Review, Psychedelic Sixties Review, Fixer Upper Review and Spy Game Review.